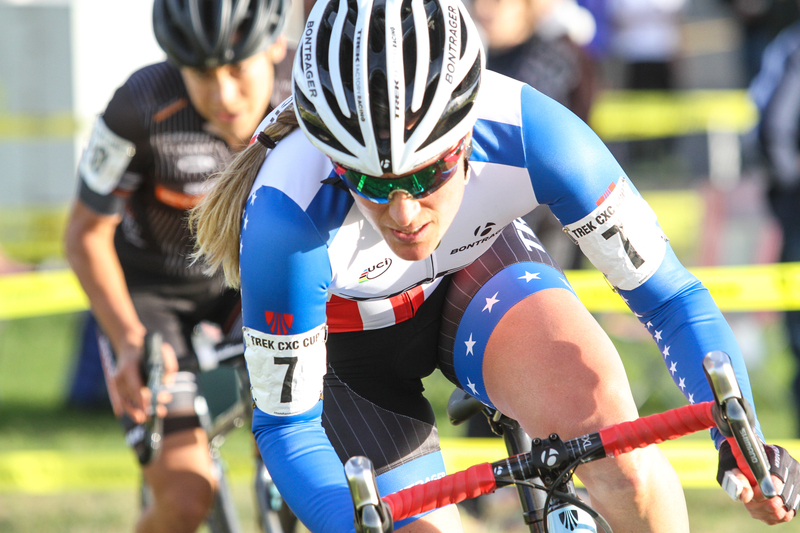 The first day of racing at the 2015 Trek CXC Cup saw U.S. National Champion Jeremy Powers (Rapha-Focus) and Wisconsin native Kaitlin Antonneau (Cannondale-Cyclocrossworld.com) win close battles on the updated cyclocross track in Waterloo, WI. The UCI C1 event, which is held on the grounds of Trek’s Global Headquarters, added several new features for 2015. The most talked about addition, a steep run up named Bontrager Hill, wreaked havoc on the peloton in the early laps of the race. Stephen Hyde (Cannondale-Cyclocrossworld.com) grabbed the hole shot, once again demonstrating that he is Powers’ strongest challenger on the domestic cyclocross circuit this season. Powers, Allen Krughoff (Noosa Pro Cyclocross) and Jamey Driscoll (Raleigh/Clement) fell into line behind Hyde, and the group proceeded to trade the lead for several laps. Powers and Hyde established a gap several laps into the action and raced head to head until the final two laps where a mistake cost Hyde the top finish. Hyde’s fall gave Powers an 8-second gap to finish in first place. As Powers rode the final few meters, a fan gave him an American flag to finish in style. “I’ve always wanted to grab a flag at a finish line and what better place to do it than here at Trek Headquarters,” Powers said. Dan Timmerman (Stan’s NoTubes) finished in fourth and Wisconsin native Brain Matter (KS Energy Services) finished in fifth. 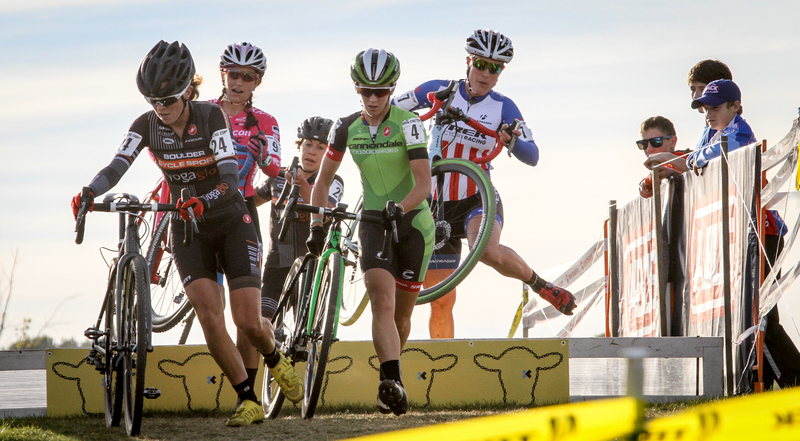 In the women’s race Amanda Miller (Boulder Cycle Sport-Yogaglo) took the holeshot and led in the early laps of the race. Miller was the lead rider in a power quartet that included Antonneau, Katie Compton (Trek Factory Racing), and Crystal Anthony (Boulder Cycle Sport-Yogaglo.) The four riders established a solid gap after two laps and stayed within striking distance of each other for the remainder of the race. Compton took several turns at the front but was continuously hit by attacks from Miller. Miller’s attacks put Compton in trouble but the 10 time National Champion stayed in contact with the leaders. On the final lap Antonneau jumped to the front of the small group and led out into the finish. 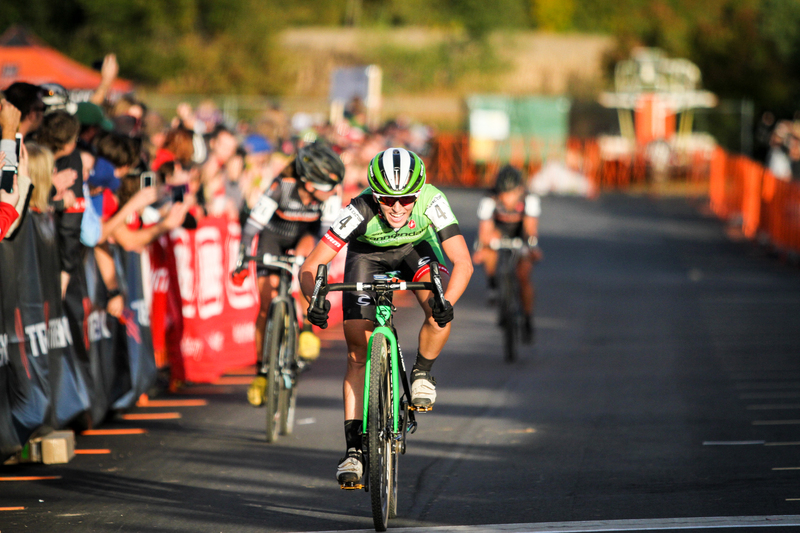 The race had unfolded perfectly for Antonneau who races for Twenty16-ShoAir and the U.S. National team during the road season. Antonneau sprinted out of the final corner and won several bike lengths ahead of Miller. It was a Antonneau’s second C1 victory of the year, and especially sweet due to the army of family, friends, and fans that came to cheer her on. Miller finished in second, followed by Anthony in third and Compton in fourth. 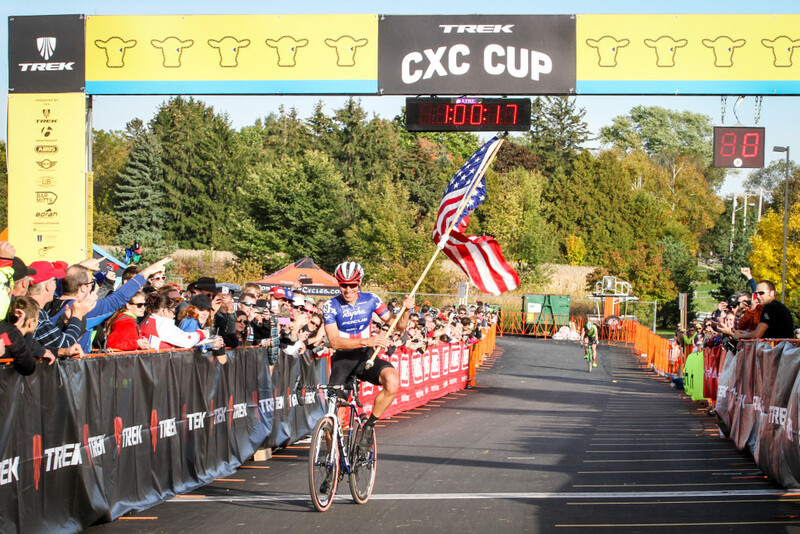 It was a disappointing finish for Compton who won both days of the Trek CXC Cup in 2014. Caroline Mani (Raleigh-Clement) rounded out the leading group in fifth place.